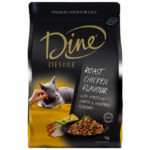 The first thing you’ll notice is the elegant black and gold packaging and lettering along the lines of “Roast Chicken Flavour”. The keyword here is “flavour”, which in labeling terms says absolutely nothing about the product. It’s like selling quorn and saying it’s chicken flavoured. The first ingredient is wholegrain cereals. Why would we feed a carnivorous animal a diet of cereal grains? Grains are bad for cats. The second ingredient is meat, but it’s ambiguous and inclusive of by-products. This’ll be a combination of poultry, beef, and lamb from a 4D meat rendering plant. This ingredient is notorious for being horrid, often inclusive of diseased and rotten corpses cooked up in a vat along with any other vermin that happens to be feeding on the flesh. Other ingredients in the food such as poultry digest and animal tallow are telltale signs as to the source of the ingredient. If you were to see meat being rendered in such a way your stomach would turn and you may be inclined to vomit. Meat ingredients are weighed prior to cooking when they’re full of water and significantly heavier. Once cooked the food will be much more grain than meat. That leaves a problem as cats need a diet high in protein (from meat), so a food mostly cheap grains will be lacking. To counteract the insignificant meat in the food they’ve added cereal proteins as the 3rd ingredient. This boosts up the protein in the food (to 30%), but in a form not easily digested by a cat. Another couple of things to note about this food are flavours and food colourings and antioxidants. These won’t be natural, they’ll be artificial and chemical. I wouldn’t want to feed this to my cat. Wholegrain cereals, meat and meat by-products, (poultry, beef and/or lamb), cereal proteins, poultry digest, animal tallow, vegetables, vitamins and minerals, salt, amino acids (including taurine), flavours, cheese powder, food colourings and antioxidants.